Hello! It's been pretty hot lately. Summer is in full swing for sure. I pulled out my inks and dies to create this Summer themed card. 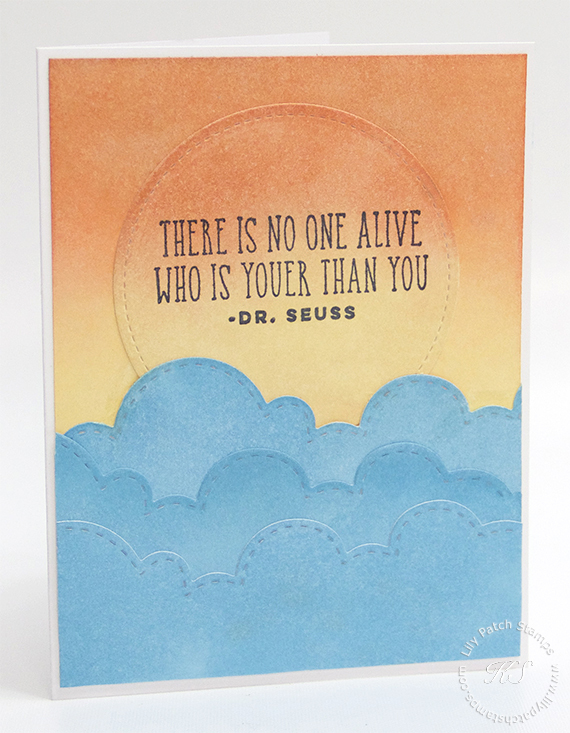 I love this Dr. Seuss quote from A Muse Studio. I started by sponging the buttercup and orange pigment inks onto the white cardstock. I also sponged ocean onto another piece of white cardstock and using the Landscape die, I cut out the water portion for my card. Last of all was to stamp the sentiment onto the die cut circle. Say Good-bye to Quarterly Minimums. Join today and enjoy the benefits and discounts on all your stamping supplies. Click image for more details. What a nice card and lovely text. Thanks for joinging our die cuts challenge over at Crafty Friends. That's so lovely! Fab card. Hello... Thanks for joining our challenge with your lovely project. Great use of Dies for our challenge theme. Good luck and hope you can join us again for our next challenge.